Apparently, The Raconteurs are more than just a vacation for Jack White-though you’d be forgiven if that’s all you thought they were when their debut album, Broken Boy Soldiers, appeared two years ago. After all, his gig with Meg has turned White into one of the biggest rock stars of the new century, and earned him the chance to collaborate with everyone from Loretta Lynn and Beck to Bob Dylan and the Rolling Stones. And it certainly didn’t help that, clocking in at just over half an hour and packed largely with lightweight pop songs, Broken Boy Soldiers always felt a bit slight, fun though it may have been. But his side-band’s new album, Consolers of the Lonely, is anything but slight; in fact, it’s a monstrously large, overstuffed albums filled with energy and ideas and songs with real weight. 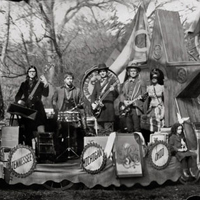 White’s tackled this record with the same conviction and creative integrity he brings to his regular gig, enough so that it’s beginning to feel wrong to refer to the Raconteurs as his side-band. And though that makes Consolers a really great album, it’s also, in a small way, one of the album’s most obvious weaknesses. Jack’s nothing if not a compelling and charismatic rock star, and when he’s on, it’s hard not to pay attention to him, to the point that he tends to overshadow his bandmates here-not because they’re lesser musicians, just because they’re not as flashy as he is. Then again, co-frontman Brendan Benson has a sense of stoic professionalism and craft that makes a good foil for Jack’s more reckless approach. So even though the Raconteurs occasionally feel a bit like Jack White and his Backing Band, playing with a regular four-piece brings a focus to Jack’s work that allows him to do things here he can’t do with just Meg in tow. And that’s not to say that Jack’s mellowed out here; on the contrary, he still comes unhinged just like he always has, and some of the album’s most gleefully rocking numbers vaguely resemble the frantic thump of some of the White Stripes’ work. But minimalist blues this ain’t; Consolers of the Lonely covers a remarkable range of stylistic ground, with the common thread being the maniacal energy and unique vision of the band itself. This is their own revisionist take on classic rock and Americana, a crash-course in rock history as seen through the eyes of White and Benson, and so they touch on everything from primitive, Who-style riffs (”Consolers of the Lonely”) and Stonesy rockers (”Hold Up”) to Mariachi melodrama (”The Switch and the Spur”), country (”Old Enough”), and horn-drenched Memphis soul (”Many Shades of Black”). It’s a ramshackle, careening monster of an album, skidding along at a breakneck pace and probably reaching a bit too far, but its sprawl and its heft are part of its appeal; this is the sound of four musicians who love rock and roll so much that they dig into it with joyful abandon, alive with ideas and trying anything and everything they care to. They’ve left the power-pop of their first album far behind them, and their new record is a stomping good time because of it-not to mention proof that The Raconteurs are much more than just Jack White’s preferred vacation spot.